It’s hard to believe, but Monday starts July! Being Girl Scouts, who are always prepared, prepare yourself for the upcoming month with… Girl Scouting in July. June 1st marks the beginning of National Clean Beached Week. Living on Long Island, we are surrounded by beaches. This is the perfect time to get your Girl Scout Troop together to take a walk along the beach… while you’re at it, make your beach a clean beach by picking up any trash you may find while on your walk. Who knows… this walk may inspire your troop to Take Action through a Take Action Project. July 4th is Independence Day! Bring your troop together to work on one of the cooking badges with a BBQ theme. Brownies can work on the Snacks badge by making snacks as the appetizers, while Juniors work towards earning the Simple Meals badge, Cadettes can turn this Fourth of July BBQ into a tour of different dishes made in the USA since 1776 while earning their New Cuisines badge. 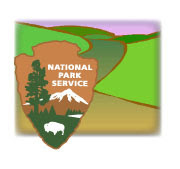 July 13th GSNC is offering Off the Path - a special hike around Sagamore Hill National Historic Site for Daisy and Brownie Girl Scouts. Girl Scouts will be led down the road less traveled as they discover hidden pathways around Theodore Roosevelt’s Oyster Bay home. July 16th Girl Scout Brownies are invited to Summer Scenes in the Garden at Clark Botanic Gardens to observe the wonders of nature and water. Around every turn there is a new scene to enjoy as the girls stroll through gardens! Along the way they will have the chance to stop and sketch a pond scene, hear about the different habitats and end with each girl making a terrarium and learning all about the water cycle. WOW! July 21th is National Ice Cream Day! 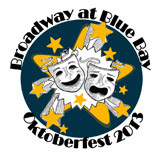 Need we say more?? It’s another great reason to get together with your Girl Scout friends. Go out for an ice cream sundae so you can get that Ice Cream Sundae Fun Patch. As an extra treat, check the back of your June issue of GirlFriends for 25% off your entire order at Friendly’s (see coupon for complete details). July 28th is National Parents Day! So remind your Girl Scouts to give their parents a hug and to say, “Thank you for all you do!" Have you been trying to find new ways to wear your Girl Scout scarf? If so, then today is your lucky day. We here at Girl Scouts of Nassau County are running a new mini blog series on how to tie your Girl Scout scarf. For those of you who don’t know, Donna Ceravolo has been recognized for her wide variety of scarves and different ways to tie them. You never know what you might find Donna wearing, from simple square knots to elaborate bow ties; your selection will never seem dull! Throughout this mini-series we hope to inspire your creativity when it comes to stepping up your Girl Scout uniform! You can pick up one of our beautiful scarves in the Girl Scouts of Nassau County shop, or online at shop.gsnc.org/store/. Follow the simple step-by-step instructions and you'll be on your way to a whole new updated look for your Girl Scout uniform! The first scarf we are using is a long and narrow silk scarf. First, you must fold both edges of scarf to meet in the center. Second, drape the folded scarf around the back of your neck. Cross the left side over the right, creating an “x”. Then bring the top piece underneath the bottom then through the hole that your neck is in... it will appear as the beginning of a knot. Just let the two ends of the scarf drop down to hang. This should not be close to your neck. It should hang around your upper torso. Wave the Flag - Celebrating America! Girl Scout Brownies Celebrated What Makes America Special!! 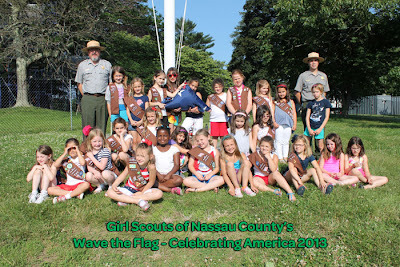 Girl Scout Brownies celebrated what makes America special at the Oyster Bay home of Theodore Roosevelt, 26th President of the United States at the Wave the Flag- Celebrating America program held on June 20th. They learned interesting facts about the American flag, walked in the footsteps of TR on a nature walk, learned why TR picked the Oyster Bay community to build a home and learned how to take care of the American flag. It was an exciting program filled with smiles. Girl Scouts could be found climbing over fences and running around the vast property that was TR’s Sagamore Hill. 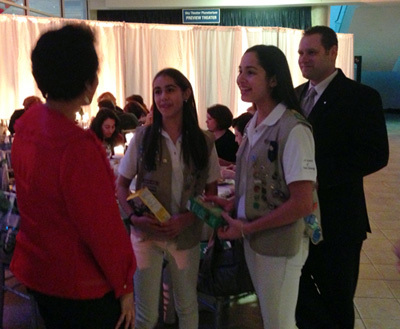 Tuesday June 11, 2013 was the Girl Scouts of Nassau County’s Gold Award ceremony at Adelphi University. Once the girls arrived, the evening began! Before the ceremony, the girls each stood next to a board and described their projects to their sister Scouts, parents and guests. Shortly afterward, the girls moved to the ballroom and our ceremony began. Girl Scouts of Nassau County’s Executive Director/CEO, Donna Ceravolo welcomed the audience and spoke to the girls about wearing their Gold Award loud and proud, comparing it to the rank of an Eagle Scout. Donna’s words were encouraging and hopeful for all of the girls' futures as they push onward into their college careers and for the rest of their lives. Melanie Pavlidis, the evening's Mistress of Ceremonies, was introduced. Melanie welcomed the Ceremonial Unit presenting the flags, along with out Girl Scouts of Nassau County Chorus who performed a few numbers. Melanie introduced Carolina Torres, the Keynote Speaker for the evening. Carolina told her story of how her neighbor was selling Girl Scout Cookies and convinced her to join. She discussed the many doors that joining Girl Scouts has opened for her now. She gave the girls someone to look up too, even though she is still young herself. Carolina has achieved so much and has had such powerful leaders in her life as role models. She showed the audience her Junior vest, Cadette sash, and Ambassador vest. All of which were COVERED in patches. Carolina has achieved so much in her 20 years on this earth and ten years as a Girl Scout. Carolina was an excellent choice for keynote speaker because she was recently where these girls are and has used Girl Scouts to move forward in her own life. After hearing from Carolina, Melanie came back onto the stage and invited Wanda Jackson, Girl Scouts of Nassau County's President and Chief Volunteer Officer, and Donna Ceravolo to present the girls with their Gold Award pins and Gold Award Alliance Certificates. Melanie described each girl's projects and accomplishments. After all of the girls received their award, GSNC’s President and Chief Volunteer Officer Wanda Jackson spoke to the Gold Award Recipients. With congratulatory words and best wishes, Wanda encouraged the girls to keep doing wonderful things and to stay involved in Girl Scouting. She also raised attention to the women in the audience that have received the Gold Award, and the men who have achieved the Rank of Eagle Scout. With praise, they were all acknowledged and applauded. Additionally, Ms. Jackson called upon 2013 Gold Awardee Carolyn Etienne and her mother, Patricia Kelleher Etienne, to accept a replica replacement of the Golden Eaglet awarded in 1938 to Frances Kelleher, Carolyn's grandmother/Patricia's mother. Mrs Kelleher's original pin was lost and efforts were made to replace it for Mrs. Kelleher shortly before her death in 2012. The moment was special to the family and touching for the audience. Following Wanda’s speech, Melanie was brought up to the podium for her final words of the evening. Closing out for refreshments and of course…Girl Scout cookies! Involvement of Girl Scout Dads Growing by Leaps and Bounds. 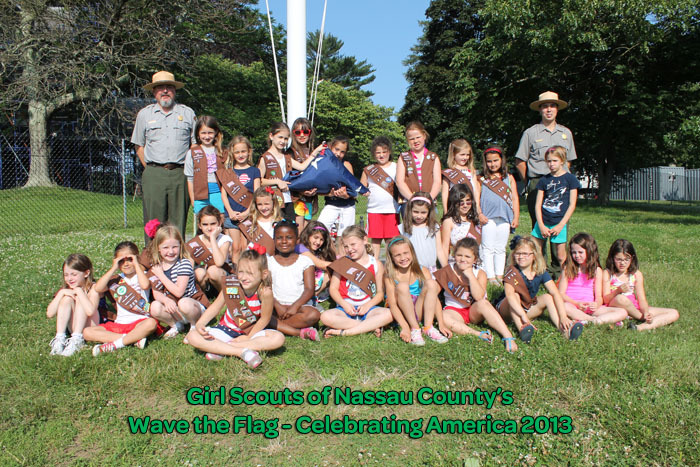 The Girl Scouts of Nassau County (GSNC) are gearing up for Father’s Day by reminding the community that ‘Girl Scouting’ is not just for girls. In recent years, the Girl Scouts have seen an explosion of involvement from the girls’ fathers. Their participation in their daughters’ lives through the Girl Scouts gives fathers the opportunity to share significant quality time with their daughters and watch them grow into young women with bright futures. Active fathers gain added benefit of building relationships and a community with other Girl Scout Fathers. “The greatest thing about being a part of my daughters’ Girl Scout Troops is seeing my daughters develop wonderful leadership skills and a sense of caring for other people that Girl Scouting fosters,” said Hal Crawford, a father of two Nassau County Girl Scouts. He explains his experiences as a Boy Scout and Eagle Scout have driven his involvement with the Girl Scouting of Catherine, 12 years old and 9 year old Julianne. 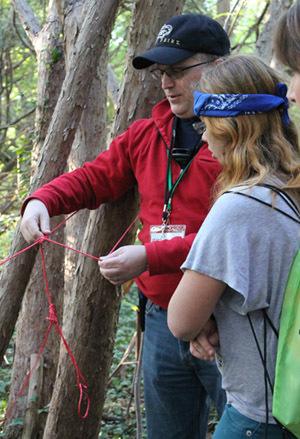 Crawford along with his wife Dawn, directly participates in helping his girls with projects including knot tying and also reinforces the sense of character the girls learn through their Girl Scouting. The fathers who are active in their daughter’s Girl Scout Troops find a reward beyond bonding their daughters. Girl Scout fathers build lasting friendships and a strong sense of community with each other. “Scouting with my daughters allows me to reinforce bonds with my children while also creating new bond and friendships with the other fathers,” said Crawford. Steve Kitchener began his involvement with the Girl Scouts over 10 years ago after his daughter Brianna, 17, asked him to go camping with her troop. Seven years ago Brianna asked him to coach a robotics team through Girl Scouts. 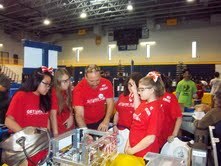 “The robotics team was just the tip of the iceberg for me. I am now camp trained, trip trained and CPR trained.” Kitchener, whose wife Diane is a Scout Leader and Co-Coach of the robotics team, was always an involved father as coach of his children’s sports teams, but his involvement with the GSNC holds a special place in his heart. “You are really missing out if you aren’t involved. Being a part of the Girl Scouts opens doors for you to bond with your daughter on so many levels, even more so than simply coaching a sport.” Steve Kitchener is also serving as a Member-at-Large of the Board of Directors for GSNC. My family is pretty good about remembering to put our flags out for those great Monday holidays, and Thanksgiving and Veteran's Day, but I have to admit that there have been a few years when June 14 came and went, and only later did we realize that we had forgotten to post our flags on that very special day. In doing some web searching for this piece, I found a number of stories of how June 14 became our Official Flag Day. There is agreement that the Continental Congress adopted the forerunner to the current banner we recognize as the Flag of Our Country on June 14, 1777. And most sources cite, Mr. Bernard J. Cigrand as the individual citizen who did the most to champion June 14 as a National Flag Day, beginning his crusade in 1885, when he was a school teacher in Wisconsin. Mr. Cigrand eventually became a dentist and moved to Illinois and was President of the American Flag Day Association, and later the National Flag Day Society. In 1916, President Woodrow Wilson declared June 14 as Flag Day, and in 1949 it was established by an Act of Congress. However, Flag Day is not a national holiday. 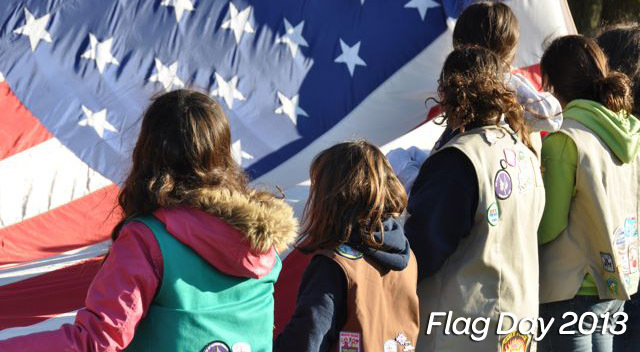 Here are some resources for learning more about Flag Day and how to honor this important symbol of the United States of America. "On my honor, I will try to serve God and my country ...."
Summer of 2013 is the perfect time to send your children for their first experience at summer camp! Attending a summer camp provides a safe environment for your children either throughout the day or overnight. Aside from being a secure place for your child, it will be a fun experience that will provide years of amazing memories. Interaction without Technology. 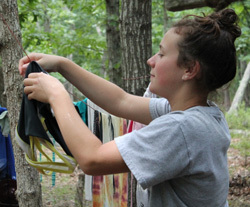 One reason you may want to consider summer camp for your child, regardless of age, is camp’s interactive nature. Activities like sports, team building, theater, and crafts take your child away from the technology based world in which they live, and focuses on engaging in worthwhile activities that will enrich their minds. They can participate in arts and crafts, sports, and simply getting to know one another. Education in disguise. 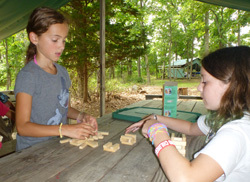 Along with being interactive for children, camp can be educational. Depending on the camp that your child attends and their age, the program may incorporate a school-like aspect. Specifically for younger children, learning can be applied simply and in fun ways like teaching math and physics through games. Therefore, children may not feel as though they are learning, but through activities such as coloring or group work they are opening their eyes to new possibilities. Last year at GSNC’s Summer Fun Day Camp, girls learned about reptiles, while holding and playing with them. Independence and Responsibility. Children who go to camp learn how to care and be responsible for themselves and ask for help when it is needed. They learn to make their beds in the morning and keep their bunk/tent/troop house clean (camp counselors will provide guidance and keep the kids safe, but they don't usually make beds). "At camp, every morning after breakfast, the other girls in the cabin and I would each have a chore. Making our beds, sweeping the floor and folding our clothes all had to be done before the rest of the day’s activities could begin. It was a valuable lesson in how to care for myself" said Cassie. Unbreakable Bonds of Friendship. Another great reason to send your kids to camp is the potential to develop lifelong friendships through a shared bond at a summer camp. 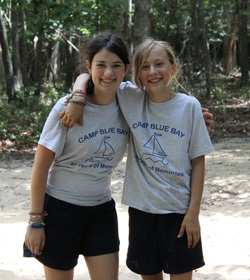 "Even 10 years later, I still speak with friends I made at camp. We shared many experiences together from being away from our parents for the first time and sleeping in a cabin to horseback riding up a mountain and white water rafting down a river. These are the experiences that bonded us together into not just friends, but sisters" said Cassie. 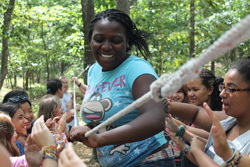 Whether simply between campers, or between camper and counselor, camp is excellent for building interpersonal skills.